What's a Ladies Night Out without a fashion show? 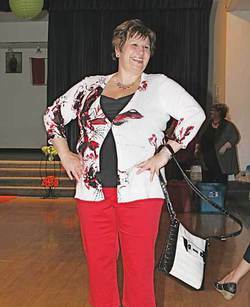 All the Jewellery was from Lia Sophia and Millet's Butterfly Boutique provided all the frockery that strutted down the catwalk on Saturday April 27th in Calmar at the New Humble Playground Fundraiser. A fun and interesting fact that was announced prior to the start of the fashion show was that all of the lovely models in the show came from one very large local family! The little town of Calmar was overrun with ladies looking for a good time last weekend, but all in the name of a great cause. It all began when the Parent's Association at New Humble School was warned a couple of years back, that their playground would probably need replacing in a few years as it was getting old and could cause some safety concerns in the years to come. This prompted the enterprising and energetic ladies in the group to begin brainstorming on how they could raise the approximately $75,000.00 it would take to replace the playground. In 2011 the group decided that if they began by raising $5,000.00 a year they could raise 1/2 the funds by the time they needed to replace everything, and different grants could make up the rest. The president of the Parent's Association, Giselle Messer, admitted that each year the Assoc. had fallen short of their goals and that it was causing her sleepless nights trying to figure out how to raise more money. "So one night I was laying in bed not sleeping," shared Giselle, "and it just kind of came to me; 'What about a ladies night?' As far as I knew it had never been done in Calmar." Bringing the idea to the PTA in January, Giselle discovered that they thought it was a great idea! "We did the math and found out that we would break even at 50 tickets, so we were thinking that if we sold 60 we'd be doing well. We had no idea how the community was going to respond to this so when we sold 50 tickets in the first couple of weeks we were ecstatic! Then it seemed to take on a life of it's own!" laughed Giselle. "Shortly after that we had 100 tickets sold, then overnight it was two hundred, and at 250 we had to start a waiting list!" The community got behind this fundraiser in a huge way with amazing donations to the silent auction of items like two rounds of golf with a cart from the Leduc Golf and Country Club, four IMAX and general passes to the Telus World of Science, and a birthday party package from the LRC amongst many others. Giselle also spoke of how there were moments of sheer wonder as the parents were trying to collect items for the silent auction and how some businesses shocked them with their generosity. Just one example she shared was how they approached CanElson Drilling hoping for the donation of a golf shirt or something along those lines, and they received a cheque for $1,500.00! "Once they heard what the fundraiser was for they whipped out a cheque book and wanted to donate cash to get the kids their playground! This community has been totally amazing! ", stated Giselle. Another big supporter of both the fundraiser and the Parent's Assoc. is New Humble School's Principal Jennifer O'Brien. "She is a great leader, so good with the kids, and supports our parent's group in all of our endeavours." said Giselle. Jennifer's mom Patricia, a former teacher herself and also an attendee at the Ladies Night Out, commented that "This parent community is so vibrant for such a small school, and community is what it's all about." The venue for the event, the Calmar Legion, was transformed for the evening with draped black fabric and massive neon silk flowers spread throughout the room. Each sold out table had a huge martini glass centrepiece which held coloured glass beads lit from within, topped with a large flower ball. The Master of Ceremonies for the night was Jenn Dalen from 93.1 The One Fm, who readied the ladies to take in all the great information from motivational speaker Tammy Ward. Once Tammy's presentation concluded, Mrs. Pamela Carstairs took to the floor and got everyone ready to rock by belting out The Judd's number one hit "Girl's Night Out". Immediately following Pamela's performance a fashion show with outfits provided by Millet's Butterfly Boutique and jewellery from Lia Sophia hit the floor. A really fun aspect of the fashion show was that all seven ladies who were models in the show covered a range of generations and they were all from one family! You know it's a good party when at one point during the evening the bar ran completely out of wine and a couple of the ladies had to dash over to the liquor store to restock! The party went on late into the night with fabulous amounts of fun being had by all attendees and supporters. From the initial idea to hopefully raise $500.00-600.00 with this fundraiser, the Parent's Association were astounded to learn that the rough estimates for their Ladies Night Out brought in no less than $17,000.00! So coming from a mom who had originally been concerned about sending her children to such a small, rural school when the family moved to the area just four years ago, Giselle avows, "When I discovered that my kids would be going to school in a farmer's field I remember thinking 'This is going to be okay???' But since then I have discovered what a phenomenal community and school this is and I would not want my kids to go anywhere else!"